1 Universidad Nacional del Sur, Departamento de Biología, Bioquímica y Farmacia, San Juan 670 (8000), Bahía Blanca, Argentina. *Corresponding author (aferrero@uns.edu.ar). Received: 14 April 2008. Accepted: 16 June 2008. Rice weevil (Sitophilus oryzae L.) is a primary insect pest of stored grain. The development of resistance resulted in the application of synthetic insecticides. In recent years many plant essential oils have provided potential alternatives to currently used insect control agents. The Brazilian pepper tree (Schinus molle L. var. areira (L.) DC.) (Anacardiaceae) has different biological properties such as insecticidal activity. In this study, repellent, fumigant activity, nutritional indices, and feeding deterrent action were evaluated on S. oryzae adults. Filter paper impregnation was used to test fumigant toxicity, whereas treated whole wheat was used to evaluate repellent activity and a flour disk bioassay was done to evaluate feeding deterrent action and nutritional index alteration. Leaf essential oils showed repellent effects at both concentrations (0.04 and 0.4% w/w), while fruit essential oils lacked repellent activity. Both plant oils altered nutritional indices. Fruit essential oils had a strong feeding deterrent action (62%) while leaves had a slight effect (40.6%). With respect to fumigant activity, neither of the essential oils was found to be toxic. Key words: Schinus molle, Sitophilus oryzae, repellency, fumigant toxicity, nutritional indices, feeding deterrence. El gorgojo del arroz (Sitophilus oryzae. L.) es un insecto-plaga de infestación primaria de granos. El uso de insecticidas sintéticos ha desarrollado fenómenos de resistencia. En los últimos años los aceites esenciales se presentan como una alternativa en el control de insectos-plaga. El aguaribay (Schinus molle L. var. areira (L.) DC.) (Anacardiaceae) es una planta con diferentes propiedades biológicas entre las que se destacan el uso como insecticida. El objetivo de este estudio fue evaluar la actividad fumigante, repelente, los índices nutricionales y la actividad antialimentaria de los aceites esenciales de hojas y frutos de S. molle var. areira en adultos de S. oryzae. Para la actividad fumigante se utilizó la técnica de impregnación de papeles de filtro; para la actividad repelente impregnación de trigo entero; y para los índices nutricionales y la actividad antialimentaria impregnación de discos de harina de trigo. El aceite esencial de hojas mostró efectos repelentes a ambas concentraciones (0,04 y 0,4% p/v), mientras que el de frutos no produjo repelencia. Ambos aceites alteraron la fisiología nutricional de S. oryzae. El aceite de frutos produjo un efecto antialimentario fuerte (62%) y el de hojas leve (40,6%). No se observó actividad fumigante. Palabras clave: Schinus molle, Sitophilus oryzae, repelencia, toxicidad fumigante, índices nutricionales, efecto antialimentario. Harvest grains are basic human food products (Padín et al., 2002). The presence of pests constitutes a serious on-going problem in stocking grains and its derived industry (Pérez Mendoza et al., 2004). Worldwide, between 5 and 15% of the total weight of cereals, oil plants, and legumes are lost after harvesting (Anonymous, 1989), and between 5 and 10% of these losses are due to the presence of pests (Hill, 1990). In Argentina, the losses caused by insects and/or mites are estimated between 7 and 10% of total production (Viale, 1995). The legislation of this country establishes the rejection of any merchandise with a single insect and/or live mite in any commercialization stage (Resolution Nº 1975/94, Secretaría de Agricultura, Ganadería y Pesca). The rice weevil (Sitophilus oryzae L.) is one of the pests of primary infestation of stored grains, widely spread worldwide, and very destructive. Because of its high incidence, synthetic insecticides have been used to control it. Resistance and toxicity problems of the synthetic insecticides have resulted in the necessity of finding more effective and healthier alternatives. Thus, essential oils are the most tested products presently (Papachristos and Stamopoulus, 2002; Umoetok and Gerard, 2003; Zhang et al., 2004; Tapondjou et al., 2005; Ferrero et al., 2006; Sánchez Chopa et al., 2006, Stefanazzi et al., 2006, Wang et al., 2006). Different biological activities of plant derivatives have been demonstrated for the control of stored grain pests (Golob et al., 1999; Rajendran and Sriranjini, 2008). The Brazilian pepper tree (Schinus molle L. var. areira (L.) DC.) is associated with agricultural crops in boundaries, windbreaks, riverbank protection, and watershed conservation. In popular medicine, it is use for its astringent, diuretic, antispasmodic properties among others. In pest control, it is used as a fumigant, repellent, and ovicide (Ruffínengo et al., 2005; Ferrero et al., 2006). The objective of the present study was to evaluate the fumigant, repellent and/or attractant, feeding deterrent activity, and the alterations in the nutritional physiology produced by the essential oils from leaves and fruits of S. molle var. areira on 3- to 4-day-old S. oryzae adults. The insects came from a susceptible colony maintained in the Cátedra de Zoología Agrícola de la Universidad Nacional de Buenos Aires (UBA). They were bred in glass containers, 8 cm in diameter, 13 cm high, sealed with fine netting, maintained at 28 ± 1 ºC, 60-70% HR, a 12:12 photoperiod, and using whole wheat grains as food. The vegetal organs (leaves and mature fruits) of the pepper tree were collected during the summer period in Bahía Blanca city, Buenos Aires, Argentina (38°41' S; 62°17' W). A specimen was deposited in the Herbarium of the Departamento de Biología, Bioquímica y Farmacia de la Universidad Nacional del Sur (BBB) and identified as number CV 10444. The essential oils were isolated using fresh vegetal material by accelerated distillation of water vapor using a Clevenger-type device during 3 to 4 h, and were analyzed with gas chromatography and mass spectrometry (GC-MS HP5972A) in a HP5 (30 m x 0.25 mm) column with a temperature program of 50 ºC during 2 min, a 5 ºC min-1 ramp, and a final temperature of 200 ºC during 15 min. 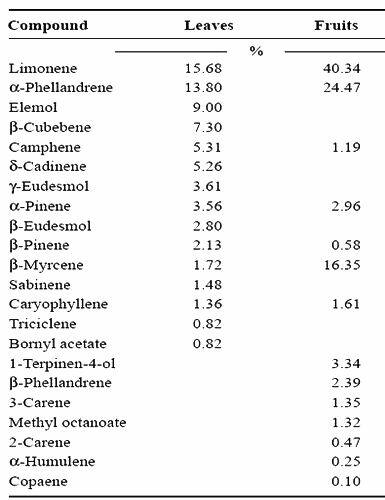 The composition of the oils from both vegetal organs can be observed in Table 1. Oil yield was 0.22% and 0.42% (w/v) for leaves and fruits, respectively. The yield was calculated using fresh vegetal material. Table 1. Essential oil constituents from leaves and fruits of Schinus molle var. areira. Repellent activity of the essential oils from leaves and fruits of S. molle var. areira on S. oryzae adults. Anexperimental field made of a central box connected by cylinders to four boxes symmetrically distributed around the first was used. Two boxes received 2 g of whole wheat treated with 2 mL of hexanic oil solutions at 0.04 and 0.4% (w/v), and 2 g rations impregnated with 2 mL of hexane were put in the remaining boxes as controls. In the central box, 40 unsexed 3 to 4 days old adults were released. After 24 h, the preference index (PI) was calculated using the Equation . where PI: -1.00 to -0.10 indicates repellent plant, PI: -0.10 to +0.10 neutral plant, and PI: +0.10 to +1.00 attractant plant. Furthermore, the repellency percentage was calculated based on the number of insects found in the control at the end of 24 h (Procopio et al., 2003). Three replicates were carried out. Nutritional indices and antifeeding activity of the essential oils from leaves and fruits of S. molle on S. oryzae adults. To evaluate the antifeeding activity and the alteration in the nutritional physiology in adults, 1.6 cm diameter disks of wheat flour were prepared (Huang et al., 2002). Aliquots of 200 µL from a flour suspension in water (10 g in 50 mL) were put on plastic dishes to form the disks and were left all night to dry in a chamber at 25 ºC temperature and 60 to 70% relative humidity (Dalvo, model MCI/2 V.c.a 220, Argentina). The disks were weighed registering values between 70 to 78 mg. Hexanic solutions of the oils were prepared at concentrations of 0, 0.5, 1, 2, and 4 mg disk-1. Two disks of wheat flour were impregnated with 5 µL of these solutions, weighed, and put in separated containers. A control group with hexane treated disks was prepared. Ten 3- to 4-days-old adult insects previously weighed on a scale (FX/FY series FX400, Frankfurt, Germany) were put into each container. After maintaining them during 72 h in controlled conditions, the weight of the disks, mortality, and weight of insects alive were registered. Six replicates were carried out. Each assay was repeated independently at least three times. The nutritional indices were calculated: Relative growth rate (RGR) = (A-B)/(B x day), where A = weight of insects alive on the third day/number of insects alive on the third day; B = original weight of insects/total number of insects; relative consumption rate (RCR) which indicates the consumption of the insects related to their initial weight and the duration of the assay RCR = D/(B x day), where D = biomass ingested (mg)/number of insects alive on the third day; efficiency of conversion of ingested food (ECI) (%) that indicates the quantity of food used for weight gain in the insects, ECI = (RGR/RCR) x 100. To obtain the antifeeding effect (AE), EA (%) = [(C-T)/C] x 100 was calculated where C = consumption of control disks (mg) and T = consumption of treated disks (mg) (Farrar et al., 1989). Fumigant activity of the essential oils from leaves and fruits of S. molle var. areira on S. oryzae adults. Filter papers, 7 cm in diameter, were impregnated with 1 mL of hexanic solutions of the essential oils from leaves and fruits at concentrations of 10, 20, 40, and 80 mg L-1. Hexane was used as a control. The solvent was left to evaporate during 5 min. The treated filter paper was put at the bottom of a 350 mL glass jar. Ten insects were put in each small glass tube of 5 cm high and 3 cm in diameter, with whole wheat and both open ends, covered with a fine netting to avoid them to scape. Each vial was suspended with a metal thread in the geometrical center of the jar which was hermetically sealed with a cover. The assay was carried out at controlled temperature and relative humidity conditions (28 ± 1 ºC, 60-70% RH), and a 12:12 photoperiod. Three replicates were done. Each experiment was repeated independently at least three times. The percentage of mortality was evaluated after 72 h and expressed in mg L-1 of air. The data were analyzed by simple ANOVA test, completely randomized design prior normalization with (√ x + 1)1/2, using the replicates corresponding to each assay, and the means were separated using the minimum significant differences test with Microsoft Excel(MST, p ≤ 0.05) (Zar, 1999). R epellent activity of the essential oils from leaves and fruits of S. molle var. areira on S. oryzae adults. 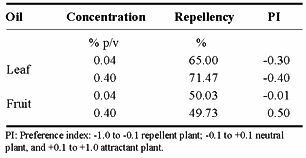 The repellent and/or attractant effects produced by the essential oils of S. molle on S. oryzae adults can be observed in Table 2. Table 2. Repellent activity of essential oil from leaves and fruits of the Brazilian pepper tree (Schinus molle var. areira) on adults rice weevils (Sitophilus oryzae). It can be inferred from the analysis of Table 2 that the oil from leaves at both concentrations produced a repellent effect. However, the oil from fruits at the highest concentration produced an attractant effect whereas the lowest did not show any. Nutritional indices and antifeeding activity. In Tables 3 and 4, the results corresponding to the effects produced by both oils in relation to the nutritional indices and the antifeeding activity on S. oryzae adults are shown. Table 3. Nutritional indices and feeding deterrent activity of essential oil from fruits of Brazilian pepper tree (Schinus molle var. areira) on adults rice weevils (Sitophilus oryzae). Table 4. Nutritional indices and feeding deterrent activity of essential oil from leaves of Brazilian pepper tree (Schinus molle var. areira) on adults rice weevils (Sitophilus oryzae). The oil from fruits modified the nutritional indices. RGR decreased in all the concentrations and highly significant differences were observed (p ≤ 0.01) (F: 11.34, df: 20). Differences in RCR between the concentrations 0.5, 2, and 4 mg disk-1 were observed with respect to the control (p ≤ 0.01) (F: 6.2987, df: 20). ECI was only affected (at the highest) concentration (p ≤ 0.01) (F: 6.6128, df: 20). A 54% mortality rate was observed at 4 mg disk-1 concentration. AE (P = 0.1) (F: 2.2587, df: 16) of the oil from fruits of S. molle was slight at lower concentrations whereas it was high in the maximum concentration. Values greater than 51% were considered to be high. The oil from leaves modified the nutritional indices, but contrary to what occurred with the oil from fruits, AE was slight (p = 0.07) (F: 2.733, df: 16). Furthermore, high significant differences were found (p ≤ 0.01) (F: 4.3679, df: 20) in RGR at concentrations 1, 2, and 4 mg disk-1 respect to the control. RCR decreased at maximum concentration respect to the control, and dropped off significantly at minimum concentration (p ≤ 0.05) (F: 3.1604, df: 20). The same situation was observed with ECI (p ≤ 0.05) (F: 3.3773, df: 20). A high mortality percentage was obtained with the essential oils from leaves at the highest concentration. Fumigant activity of the essential oils from leaves and fruits of S. molle var. areira on 3- to 4-days-old S. oryzae adults.No fumigant toxicity was observed at the evaluated concentrations. In this study, the essential oil of the leaves showed a repellent effect in both concentrations with repellency rates of 65 and 71.5% in the 0.04 and 0.4% concentrations, respectively. Using essential oil from the leaves of Artemisia princeps Pamp. (Asteraceae), Liu et al. (2006) observed a good repellent activity on S. oryzae. On the other hand, Amelot et al. (2003) demonstrated that oils of Ageratum conyzoides L. (Asteraceae) leaves did not produce a repellent effect on this insect. The oil from fruits of S. molle var. areira resulted attractant only at the highest concentration. The observed differences in the effects produced by the essential oils could be due to the presence of different secondary metabolites in both vegetal organs (Murray et al., 2005). The AE of the oil from leaves of S. molle was slight, whereas with fruits it was high. Valera et al. (2003) found that the essential oil of Coleus amboinicus Loureiro (Lamiaceae) was not able to induce any response in the feeding behavior of S. oryzae at high doses (1.25%), there was not mortality during the 60 h of bioassay exposition. Oils from leaves and fruits of S. molle modified the nutritional physiology of S. oryzae, altering RGR, RCR, and ECI. The oil from fruits, at maximum dose (4 mg disk-1) produced high mortality which could be due to an inhibition in the feeding behavior (behavioral effect) based on the decrease of the RCR and the high antifeeding effect. The oil from leaves at maximum concentration also produced high mortality as a consequence of a possible postingestion toxicity due to the slight AE and the decrease in ECI. Liu and Ho (1999) observed modifications in RGR, but neither in the consumption rate, nor in ECI with Evodia rutaecarpa (Rutaceae) in another Sitophilus species. The essential oil of Tagetes ternifolia (Asteraceae) also produced postingestion toxicity in other pest of stored grains Tribolium castaneum (Stefanazzi et al., 2006). The essential oils from leaves and fruits of S. molle did not produce fumigant activity on S. oryzae adults. The lack of this activity could be due to the fact that the entrance of these compounds is through the cuticle, to the need of higher concentrations to reach the mortality, or more exposition time. A similar situation was observed by Pascual Villalobos et al. (2004) using essential oils from leaves of Ocimum basilicum L. (Lamiaceae). Authors such as Negahban et al. (2007), Negahban and Moharramipour (2007) demonstrated fumigant activity with essential oils of Artemisia (Asteraceae) and Eucalyptus (Mirtacea) species on S. oryzae. In Sitophilus granarius, oils of Salvia hydrangea DC., former Benth (Lamiaceae) produced toxicity (Kotan et al., 2008). This study demonstrated that the essential oil from leaves of Schinus molle var. areira produced repellency on S. oryzae, while the fruit resulted attractant at 0.4%, and neutral at a concentration of 0.04%. Both oils altered nutritional physiology, showed antifeeding activity, and did not exhibit fumigant activity. For all these reasons, we can infer that the essential oils of leaves and fruits of Schinus molle var. areira could be considered as a natural alternative in the control of S. oryzae. Our thanks to the Secretaría de Ciencia y Tecnología (SECyT) de la Universidad Nacional del Sur, Bahía Blanca, Provincia de Buenos Aires, Argentina (PGI: 24/B109), to the Agencia de Promoción Científica y Tecnológica (ANCYT-PICTO-BID 1728/ OC-AR-PICT Nº 925) for the subsidies granted, to the Consejo Nacional de Investigaciones Científicas y Técnicas (CONICET) for its scholar Verónica Soledad Benzi.